Well, I am back at today with another "Plays Well With Others". I want to spend some quality time with Blue Rose still so today I want to talk about one that jumped out at me right away. Blue Rose works great with Swords & Wizardry White Box rules. Yes. In fact, there is very, very little you need to do to make Blue Rose more like White Box. Let's start with what I am wanting to accomplish here. White Box is OSR/D&D stripped down to the bare bones. It leaves a lot more to the imagination and the guidance of the Game Master/Referee. There is a lot of narrative control in refs hands. The AGE version of Blue Rose has similar DNA (more on that) but places more narrative control in the hands of the players. NOT ALL, but a little more. Blue Rose, in its AGE or True20 editions has DNA and elements that go back to the 3rd Edition D&D rules and the OGL. 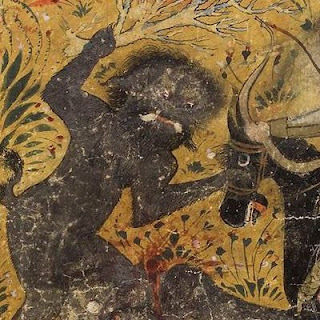 The genesis of the Swords & Wizardry rules from the OGL is more than obvious. This gives us a common thread to look at these games, a common ancestry to compare and contrast. It also informs us on how we can bring them together. One of the big surprises in Blue Rose for me as that the ability scores are all rolled on a 3d6 in order. 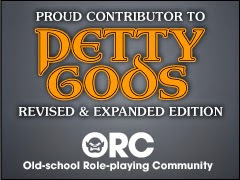 This is closer to "Old School" than some OSR games. But that is only one thing, not enough to build a larger set of connections on. White Box is not just a fun set of rules (we have thousands of those now) it is also a philosophy of gaming where less is more and the people playing need to decide what to do. That last part is 100% Blue Rose. But how do we make Blue Rose more like White Box? Well for starters let's cap the levels at 10. This is just like White Box and has the effect of negating some of the later Specializations and higher level focuses of the game. With this done the core character classes, Warrior, Expert, and Adept need to focus on the things central to their class. Fighters and Experts should not be able to take arcane training of any sort really. Adepts should be focused on either an arcane path (magic-users) or a divine on (clerics). Want a REAL restricted game? 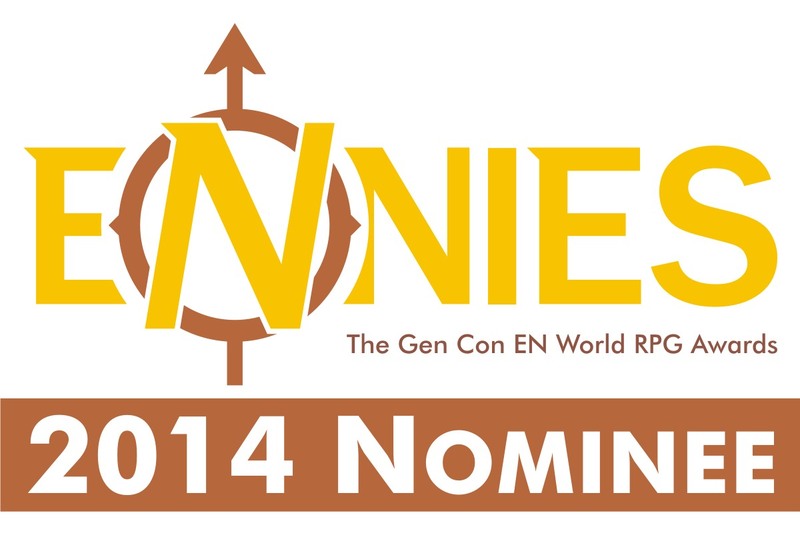 Don't have a cleric analog. Though you will need to consider what to do about healing. Ending the levels at 10 restricts the classes to only one specialization. This is perfect for a White Box-inspired Blue Rose. I would limit Experts to specializations like Assassin or even Pirate. For a real White Box feel I would create a "Thief" Specialization. For a Cleric, have the Adept take the Healer Specialization. Warriors have the most flexibility. They can take the Champion, Guardian, Knight, Outrider, or Slayer. For true White Box feeling, drop the thieves completely, and let Experts take the Healer Specialization. Then you have three class to three classes. For your races, you can crib the races from Fantasy AGE. The big question is, "Why even do this?". Simple. 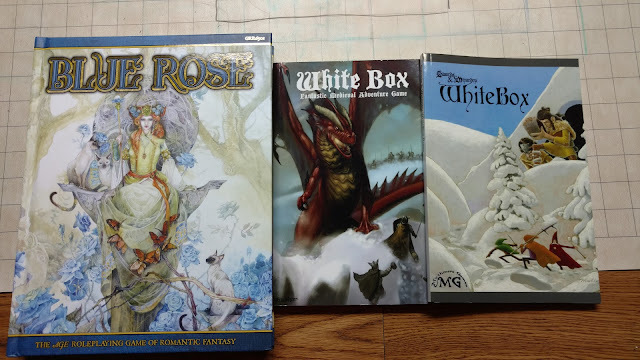 I can use White Rose as a "gateway drug" to Blue Rose for people that play White Box or another OSR clone. I would run it as more or less a straight up D&D-like game with only some "Blue Rose" materials until later on. I would try this out with some well-known Swords & Wizardry adventures. I am thinking something like Frog God Games' Razor Coast or any Swords & Wizardry adventure by Creation's Edge Games. I have to admit, their Blue Crystal Mine has appeal to me as a gateway S&W/Blue Rose adventure, and how can I say no to an adventure called Curse of the Web Witch? I might replace his monster with my own Web Witch. I should convert it to AGE. Did you see that Modern AGE is going to be classless?